You can listen to samples of the new Hammock album here, order the CD through their store OR wait a few more days until it becomes available through the “regular” digital stores. I am DYING for the days to pass (I hardly buy a CD any more these days, so I will wait): the samples I heard simply blow all their past works out of the water! Twitter Getting People Out of Jail? Regardless of how you feel about new technologies, the fact that someone was saved from jail by twittering about it… from a remote place, deserves to be recognized as a turning point that will probably make Twitter a more ubiquitous and heavily used tool from here on out. 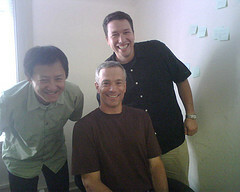 Today I had the chance to meet three of the founders of LaLa.com today, while I came by for a usability session at their office in downtown Palo Alto. I can’t share much more for now, but I will tell you one thing: these guys are here to change the world of music… And I believe they will succeed at it. More to come later.